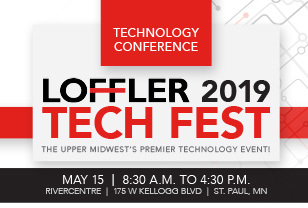 Professionally Managed IT, Document Imaging Solutions & Services | Loffler Inc.
Catch up on the latest technology trends sure to help your business run smarter, faster and more efficiently at this FREE event at RiverCentre in St. Paul! Designing solutions that fit you. Not the other way around. Technology isn't one size fits all. Tailoring the right-sized IT, cloud, voice, copier and printer solutions is what we do best. Our Managed Services allow you to focus on what's most important to help make your organization successful. From assessment, to strategy and design, to implementation and beyond, we work to exceed expectations and help organizations of all sizes be their best. From the backend computing and cloud solutions to designing the network your office phones rely on, we can help every step of the way. Our experts listen, assess, design, implement and support secure, robust IT solutions for successful business operations. With over three decades of experience in copiers and printers, you're in good hands. We've mastered the technology that your business relies on to get work done. Improve your technology processes and lower costs with a cloud-based solution that provides high performance, scalability, accessibility and availability for businesses of any size. Allowing workers to focus on their core competencies can be the key to improved operations and cutting costs. Our suite of Managed Services can keep your business a step ahead. "While many vendors promised the moon with buzz words and snappy Power Points, Loffler rolled up their sleeves with us, side-by-side, and delivered needed, “hard dollar” improvement while sustaining strong quality and timely delivery." "Our relationship with Loffler has enabled AmeriPride to develop a functional, end-to-end print management practice which has exceeded our expectations to simplify, standardize and automate our print, copy and imaging strategy. It’s refreshing to see top down sponsorship, dedication and genuine passion to deliver quality products and services from an organization we are proud to call a trusted partner."